After two months of summer break, getting back into a structured routine can some getting used to. You need to get back into the habit of…. Oh and of course packaging healthy lunches!! Of course in emergencies, your child can always purchase something in the cafeteria. But bringing a lunch from home has so many amazing benefits. 1) As a parent, you are in control of what nutrients your child is getting. 2) Packing a lunch from home is very more affordable than the cafeteria. 3) No need to worry about misplacing lunch money. But the question is where to start? Well if you keep on reading you will soon find out the secrets! When we are frazzled in the morning getting the kids out the door with lunch is not easy. They secret is to pack launches the night before. Organizing lunches the night before allows you to take your time and even get a little more sleep the next day. Having a solid balanced lunch is crucial for kids – especially if they have longer days from after school activities. 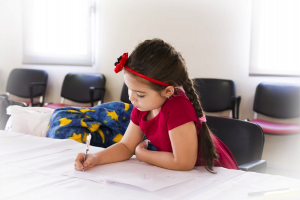 Lunch is the period of the day where your child can refuel their body, and get a much-needed boost of energy. 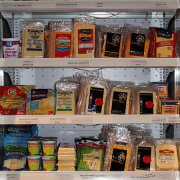 We carry lots of cryo-vac deli options perfect for a high protein lunch! Bonus Tip: If you have some extra time, you can even prepare lunches a few days in advance. 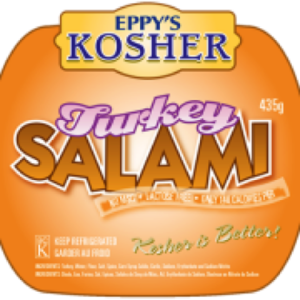 Stock up on Eppy’s Kosher Turkey Salami. It is low fat, low calorie and absolutely delicious! If you made it this far we want to say thanks by sharing our one of our favorite recipes! Fill in soft or hard taco shells. If you try out Tuesday Tacos take a photo and tag us we would love to see! Traveling while keeping kosher can feel a little intimidating at first… but like any struggle in life the more you practice the easier it gets. But don’t forget, you can also learn from those who have already mastered it! I have definitely picked up quite a few tips and tricks among my many travels and would love to share them with you. Without further ado here are my top 4 tips on how to successfully travel while keeping kosher. Snacks will be your best friend – especially if you are traveling with kids. When packing your day bag be sure to bring a few extra snacks just in case. When we travel, schedules can be unpredictable. If your day trip lasts a bit longer than you anticipated the last thing you want is to be starving with no snacks! 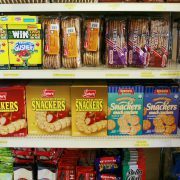 The type of snack you pack is up to you, but bags of nuts, dried fruit or granola bars are great since they are so compact. Grocery store hours of operation don’t always compliment our schedules. You can do your own research or ask around for nearby grocery stores opening hours. Once you have got that figured out, you can add grocery visits into your daily itinerary without panic. We carry our own products that can be found in grocery stores in the lower mainland. If you happen to stumble across Eppy’s Kosher products at a local grocery store we highly recommend giving them a try. We are located right near the corner of Oak St and W41st Ave in Vancouver. Definitely, something to keep in mind if you are traveling nearby. Having a mini fridge in your hotel rooms is a huge benefit! It allows you to bring back leftovers, order takeout or do full on grocery trips. The best part is if you find yourself having a midnight craving you can simply open the fridge and enjoy just like you would at home. These are just a handful of ways you can feel more confident about your travels and keeping kosher. Of course, there is always more than one way to do something. So with that being said, we would love to hear from you! What is one piece of advice you would give to someone traveling while Kosher for the very first time? Have you ever used any of the tips we mentioned above? If you are looking for guilt-free yummy food, you can’t go wrong with healthy and tasty kosher food from Omnitsky’s kosher deli. You can also find Eppy’s Kosher label on a variety of wieners in select grocery stores in the lower mainland and on Vancouver Island that are perfect for preparing meals at home. 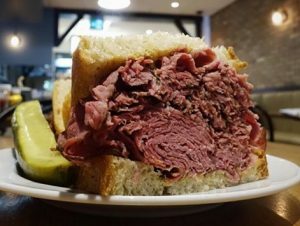 At Omnitsky’s kosher delicatessen on Oak Street in Vancouver, you can find foods to prepare or ready-made, and you can eat in or take out. If you associate the term “kosher” with Jewish dietary laws, you are perfectly correct. It means foods that conform to these laws, which is good news for consumers, Jewish or not. It is assurance to shoppers that the meat comes from animals that have been raised and slaughtered in a humane way, and Jewish shoppers know that all their dietary laws have been met for all food products that carry kosher certification labels. If you choose meat that originates in Canada, you know the animals are not kept in small, torturous cages, and know that the packing houses are clean and inspected to meet Canadian standards. If you choose kosher meats, you know that the standards that must be met for a certification of “kosher” are rigorous and the same in every country, and kosher delicatessens are regularly monitored for cleanliness. Even though kosher foods may contain pre-processed ingredients, the determination of testing and approval for kosher certification has been adapted to include such elements. 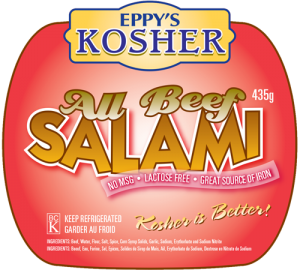 Eppy’s Kosher label is on over 150 products at Omnitsky’s kosher delicatessen, all of them MSG-free, and included are such items as gluten-free hot dogs! The Restaurant – Soups made from scratch include such favourites as potato leek, roasted red pepper, no-salt-added chicken, and many more. You can also order any of tasty sandwiches from smoked meat to turkey roll made fresh daily with delicatessen products, as well as salads, pickled beets, and other tasty side dishes. Delicatessen Products – Choose from a variety of products including smoked turkey breast, corned beef, all-beef jumbo wieners with natural casing, and fresh whole and cut chickens, cooked and raw chicken livers, and ground chicken and turkey, kosher cheeses, and packaged goods. Prepared Foods – When you don’t feel like cooking, drop by and pick up everything you need for a delicious meal such as BBQ chicken, salads, and assorted breads. As well, you can take the worry out of entertaining by ordering veggie and fruit platters, or luncheon platters or deluxe platters and condiments that feed 15 to 20 people. It is nice to know that you can purchase food retail, or order food from a delicatessen store and restaurant that is not only tasty but meets the rigorous standards demanded for kosher certification. Welcome news to all health-conscious, educated shoppers! Creative Commons Attribution: Permission is granted to repost this article in its entirety with credit to the Omnitsky Kosher Delicatessen and a clickable link back to this page. For a taste of your favourite kosher, head to Omnitsky’s Kosher Deli at 5775 Oak Street in Vancouver where you can order food to die for or shop at the kosher grocery store. Our delicatessen has a large selection of fresh meat, poultry, and taste treats just like your bubbe (grandmother) used to make. As well, there are grocery store items that range from beverages, snacks, dips and spreads, to mixes, spices, rice, barley, and pasta. 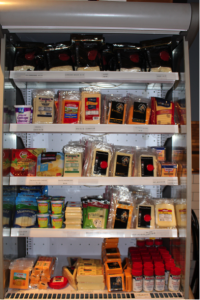 There are also organic products, kosher cheeses, other kosher items, and more. Our comfortable restaurant is ready to welcome you for breakfast and lunch, and you can take home a ready-made dinner or buy all the products you need to make your own. Breakfast: Remember when a full breakfast started the day off right? Sit down to a breakfast sandwich and a side of breakfast potato, or salami, eggs and toast, or one of the other tasty breakfast specialties. You’ll feel good all day. Lunch: This is the place where you can wrap yourself around the perfect sandwich of plain or seeded rye bread piled high (1/3 pound!) with pastrami or corned beef while munching on a crispy, sour, kosher pickle. There are many choices of sandwiches assembled each day with fresh, locally made deli products. In simpler olden times, soup was homemade from scratch and it still is at Omnitsky’s. Select from a wide choice of soups ranging from butternut squash to beef and barley, and lots in between. Add a yummy side dish like meat knish (an Eastern European snack food), coleslaw and salads, and assorted kugels. Dinner: This is the ideal deli for picking up everything you need for dinner. You can choose from such items as fresh, prepared kosher poultry—chickens, turkeys, ducks, and Cornish game hens—or BBQ chickens, roast briskets, sweet and sour meatballs, and accompanied by fresh-made-daily salads, and tasty breads. Platters for Entertaining 15 to 20 Family and Friends: When celebrating a special event, trust Omnitsky’s to take the stress out of entertaining. Pre-order platters loaded with veggies or fruits, or deli meats, or the luncheon and deli-delight platters of lox, herring, bread, egg and tuna salad, coleslaw, potato salad, and assorted breads. And there’s more! Just ask. If you are longing for some of your favourite kosher foods, you’ll find Omnitsky’s Kosher Deli has everything you want and you can order your heart’s desire.